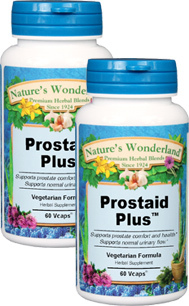 Prostaid Plus™- 575 mg, 60 Vcaps™ each (Nature's Wonderland) - Penn Herb Co. Ltd.
Prostaid Plus™ helps men feel improved comfort levels - day and night. Our popular men’s health formula features Saw Palmetto, the #1 herb for prostate support, plus traditional herbs known for their ultra soothing effect on the delicate prostate/urinary system. As an addition to the daily diet, take 1 or 2 capsules 3 times daily with water at mealtimes. SEE PDF LABEL FOR CAUTIONS.